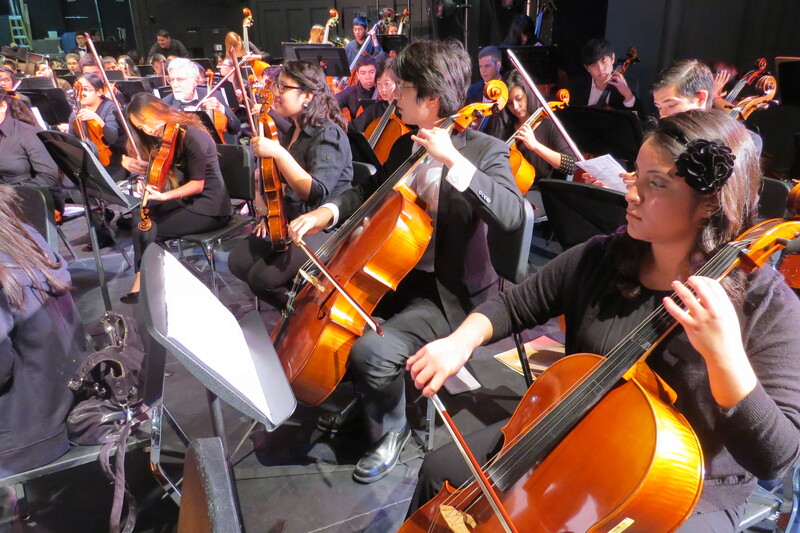 IRVINE, Calif., (April 8, 2015) – In year three of what is proving to be an invaluable collaboration, the UC Irvine (UCI) Symphony Orchestra’s adoption of the Santa Ana High School (SAHS) Symphony Orchestra expanded this year. 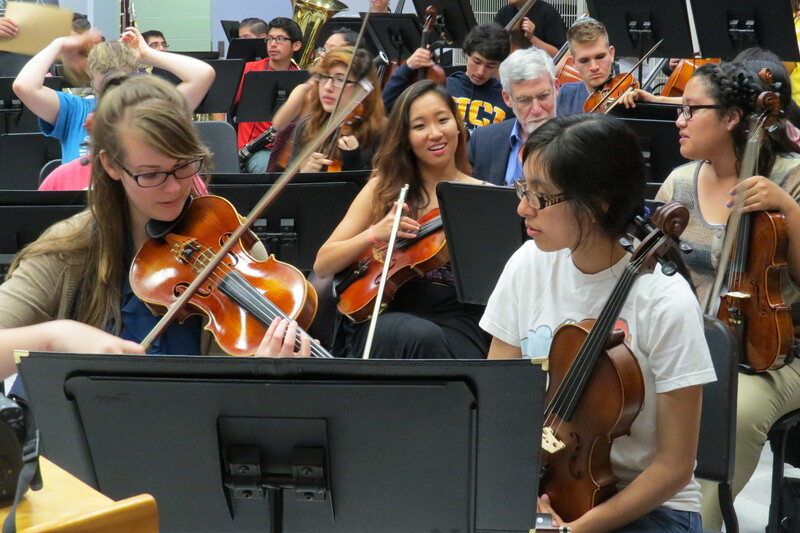 SAHS students are learning from Maestro Stephen Tucker in master classes, rehearsing on campus at UCI and playing with the UCI Symphony Orchestra in a side-by-side concert. SAHS musicians are also, for the first time, being coached one-on-one by some of UCI’s outstanding graduate and undergraduate musicians. “We added the coaching component,” explains Dr. Tucker, “because my students approached me and offered their help, ‘You don’t have to be the only one going to SAHS, Dr. Tucker, we’d love to help,’ they said.” In a high school orchestra where none of the students have ever had private music lessons, this coaching has impacted SAHS in measurable and immeasurable ways. Thanks to the work being done through this adoption, the SAHS band has been recognized by the Southern California School Band and Orchestra Association for their excellent musicianship. As a result, new instruments have been purchased to replace those in disrepair. When UCI hosted SAHS students at Claire Trevor School of the Arts (CTSA) in February, SAHS students were asked, how many were seniors, ten students raised their hands. They were then asked, how many had applied to colleges, all ten raised their hands. Finally, they were asked how many had applied to UCI, all ten again raised their hands. This response is a testament to the value of investing in young musicians, providing them access to resources and making the university experience a tangible reality. “Words cannot express how much help the UCI coaches have been to my program and the students,” says SAHS Band Director Victor de los Santos. “They truly enjoy this experience,” says SAHS Orchestra Director Joseph Kaye. The purpose of developing this partnership between UCI and SAHS is to build awareness of the university experience as a whole, not just in the arts, hopefully making it a tangible goal for the SAHS students. The program increases access to the arts resources available at CTSA so that teens and their parents know that UCI is a place for them to come to learn about and experience the arts. Finally, the partnership cultivates engaged young artists, the CTSA students, who will become engaged citizens in their communities. Mr. Kaye and Mr. de los Santos want to expose SAHS students to the arts at a college level because they believe that if their students have the opportunity to see excellent musicians, hear well-played music and see what conductors expect at that next level, their students will seek to achieve a higher standard themselves. This collaboration is made possible by grants from the Nicholas Endowment and the Pacific Life Foundation. To learn more about the Instrumental Music Department at Santa Ana High School visit http://www.sausd.us/Page/8568 or call (714)567-4900. To learn more about the UCI Symphony at UC Irvine’s Claire Trevor School of the Arts visit http://music.arts.uci.edu/symphony/ or call (949)824-6615. To learn more about community engagement at UC Irvine’s Claire Trevor School of the Arts visit http://outreach.arts.uci.edu or call (949)824-8976. As UCI’s creative laboratory, the Claire Trevor School of the Arts explores and presents the arts as the essence of human experience and expression, through art forms ranging from the most traditional to the radically new. Our international faculty works across a wide variety of disciplines, partnering with others across the campus, our national-ranked programs in art, dance, drama, and music begin with training but end in original invention. Our students come to UCI to learn to be citizen-artists, to sharpen their skills and talents, and to become the molders and leaders of world culture.